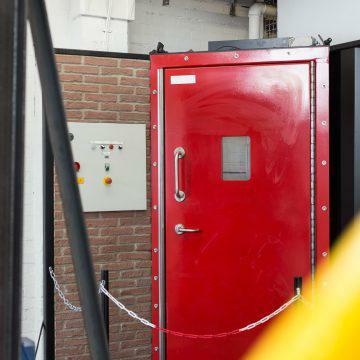 We are able to offer a wide selection of hinged and sliding door options with both fire test certification or suitable appraisals where fire testing is not possible due to size or other constraints. Fire door ratings include offshore IMO standards for A0 to H120 together with jet fire appraisals and onshore fire ratings from BS476:22 for integrity only to BS EN1634 for integrity and insulation. A combination of construction details are available from bonded honeycomb cores to stiffened fabricated door leaves for a more robust construction in hazardous and industrial areas.